The data is pretty messy. I’m not sure how they were able to categorize data into years in their map. They might be showing the same dot in multiple years. I took the liberty to clean up the data a bit. The color of the bubbles on their map are too strong and there’s no transparency. There are dots behind dots, but you would never know it. The size of the bubbles are not relative to each other. For example, there are ten cases of measles in northeast Brazil and the dot immediately below represents 138 cases. Clearly the lower dot is not 13 times larger as it should be. When you click on a Region on the left filter of their map, the map doesn’t actually filter, it merely repositions. There are lots of other issues too, but I’ll stop there; you get the idea. It’s great that they make the data available, as they should, so kudos to the foundation for that. I created the version below to communicate the story more effectively. I believe I have addressed the sizing and colors of the bubbles issues. 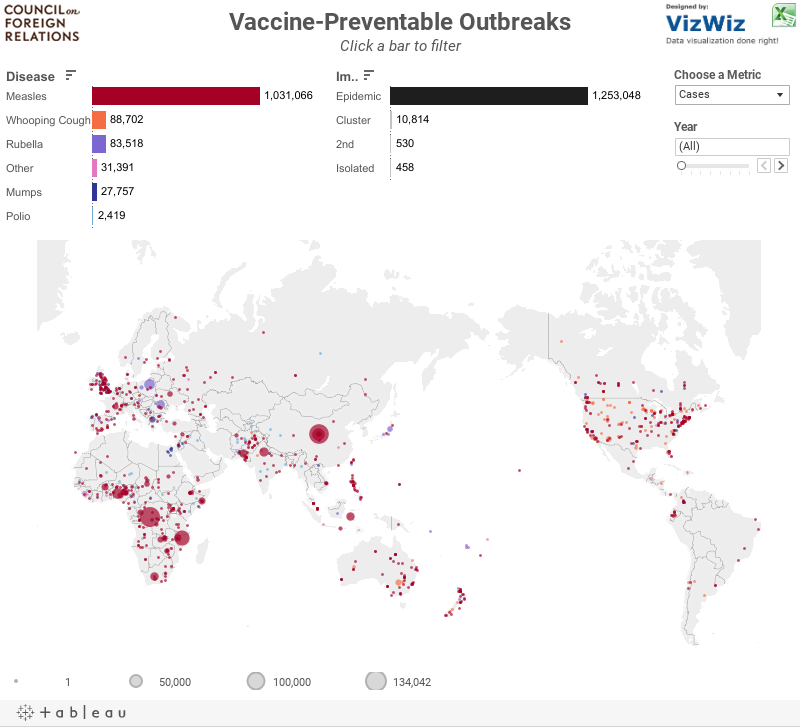 I’ve also added bar charts to provide a high-level overview of diseases and impact. Finally, I’ve made different metrics available. Their version only showed cases, where they also provided fatality data. Therefore, I included fatalities and fatality rate metrics. Last, but not least, I wanted to give a special thank you to Emily Kund for her feedback! It improves greatly on the original making the data understandable at a glance. Hi. Very nice. Nice additional touch about where the continents are placed. Now, about the size though, you might reconsider your choice of letting the data be shown proportional to the dot radius instead of the dot area. When I see some dot able to cover 169 smaller dots, I don't have the feeling it only represents 13 times more cases. Claude, the dots are proportionally accurate based on their area.